This is the new bacon ingredient. I’m guilty of sriracha overuse myself, since it’s so versatile and well, delicious. The last time I used sriracha, it found its way into a marinade in a fried chicken dish adapted from Bon Appetit magazine. The frying part is a bit tricky as the oil splattered the first time I made this, so make sure your chicken is completely coated with potato starch. In this case, I used katakuriko potato starch, which has a similar texture to cornstarch. 1. Mix 2 tablespoons sriracha sauce, 2 tablespoons soy sauce, and lime juice in a small bowl and set aside. 2. Whisk remaining sriracha sauce, soy sauce, green onions, sugar, ginger and garlic in a medium bowl. Cover and chill at least 3 hours and up to 1 day. 3. Arrange lettuce leaves, radishes, and mint in separate piles on large platter, leaving room for chicken and sauce. 4. Place potato starch in another medium bowl. Working in batches, add chicken pieces to potato starch and toss to coat. Shake off excess potato starch and transfer to baking sheet. Pour enough oil into heavy large deep saucepan to reach depth of 2 inches. Heat oil to 350F degrees. Working in 2 batches, fry chicken until cooked through, stirring often to separate chicken pieces, about 5 minutes. Transfer chicken to paper towels to drain. 5. Place chicken and sauce on platter with garnishes. 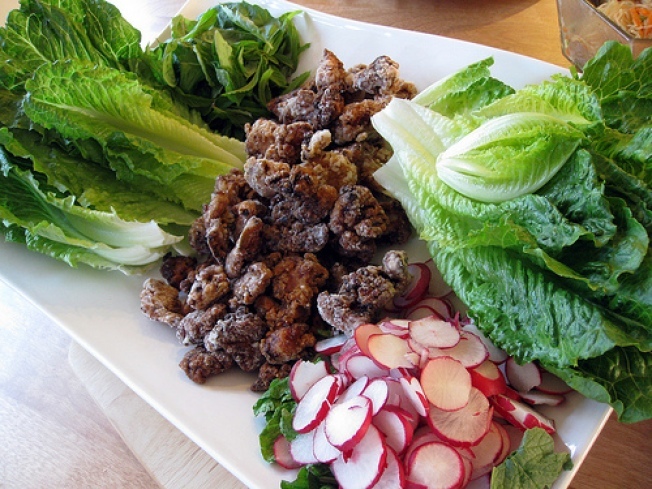 Serve, allowing guests to fill lettuce leaves with chicken, radishes, mint, and sauce.